Homeopathic remedies will help a person with reduce the muscle pains and aches symptoms of fibromyalgia, naturally. Contact us to learn more! Purchase the Banerji Protocol Remedies fFor Fibromyalgia Here! Read A Recovery Story For Fibromyalgia Using Homeopathy! Fibromyalgia is a syndrome that involves widespread pain in the muscles and joints. In 1990 the American College of Rheumatology published its criteria for diagnosis of fibromyalgia syndrome (FMS) as an official diagnosis. This effects millions of people, especially women which make up 9 out of 10 of those with fibromyalgia. It is is a common chronic widespread pain condition with tenderness at specifically defined points. Pain is often felt very intensely throughout the body. Other problems include general fatigue, depression, anxiety, sleep disturbances, headaches, menstrual irregularities, migraine, changeable bowel habits, diffuse abdominal pain and urinary frequency. Fibromyalgia is believed to be a pain amplification syndrome where the brain amplifies the pain signals. Often the symptoms will trigger after a physical trauma like a car or other accident or after an emotional trauma. There are several schools of thought the differ with medical practitioners in how fibromyalgia develops. 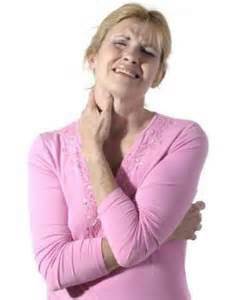 Some believe that fibromyalgia is thyroid related or viral related or hormonal related. Some believe that thyroid dysfunction can be linked to fibromyalgia and thyroid hormone resistance. Fibromyalgia is a legitimate, common entity. It is a cyclic and progressive disease which affects millions of patients, primarily women, regardless of race. Manifested by multiple symptoms that may initially last only a few days, it eventually progresses to affect multiple areas and bodily systems until patients simply cycle from bad days to worse days. Though patients feel more symptoms and get sicker over time, fibromyalgia is considered non-progressive because there is no tissue damage associated with the disease. Fibromyalgia is a confusing word for a confusing illness. The name means pain in muscles and tissues but pain is just the tip of the iceberg when it comes to the list of symptoms. Some patients with fibromyalgia experience more fatigue than pain. In fact, a system-wide dearth of energy is the common denominator of all the many symptoms of the disease. The World Health Organization recognized Fibromyalgia as a real illness, accepting the American College of Rheumatology’s criteria for diagnosis, in 1991. Prior to that time it had been known by other names including Fibrositis and Rheumatism. At this time the cause is unknown and there are no completely accepted treatments though many drugs are prescribed to ease the symptoms. There are no diagnostic laboratory tests for fibromyalgia. It is called a syndrome meaning it is distinguished by a collection of symptoms, There is a “Fibromyalgia Test” on the market which measures a certain number of these cytokines, but it is expensive and not universally accepted. It is not covered by medical insurance and its merit is currently being debated. (https://www.fmperplex.com/2013/02/25/junk-science-junk-ethics/). Theresearch team at City of Hope currently busy identifying genes that cause fibromyalgia. https://www.cityofhope.org/shively-research-fibromyalgia-research. Recent researchreported several abnormal cytokines that change during the course of guaifenesin protocol treatment. Patients are often referred from one doctor to another, and may be told that they have chronic fatigue, systemic candidiasis, myofascial pain, irritable bowel, or vulvar pain syndrome to name a few. Too often, physician and person focus on symptoms and fail to perceive the much larger problem. These dead-end diagnoses result in the treatment of symptoms which is only partially effective and at the same time ignores the underlying cause and the disease that continues to worsen over time. Unlucky patients are still told that there is nothing wrong with them and labeled as hypochondriacs. Though it is now less common, there are still physicians who believe fibromyalgia is a wastebasket diagnosis and not a real entity. It must be said that at this time if there is a commonly accepted treatment protocol it is polypharmacy: heaping medications upon medications and adding more to combat side effects. For many patients this is simply an unacceptable life sentence. The American College of Rheumatology criteria recommends searching for tender points at eighteen predetermined sites on the body to establish a diagnosis of fibromyalgia. Finding eleven or more will result in a positive diagnosis. However some patients simply have higher pain thresholds so while they complain of body aches or stiffness, they focus mainly on fatigue and cognitive impairments. These so-called Chronic Fatigue Syndrome patients suffer from the same metabolic abnormality. Since pain perception varies greatly, we urge physicians to seek objective evidence instead of the purely subjective response to variably tender points. The confirmation of fibromyalgia is far more secure when using our method of palpation that we call mapping (see here for an example). In response to this criticism of tender points, some doctors will now also question patients from a list of symptoms and may make the diagnosis based on that. Still others criticize the loosening of diagnostic criteria as an excuse for drug companies to sell more of the three drugs currently approved for fibromyalgia. Drug company recognition has been a double-edged sword. Irritable Bowel: Often called leaky gut, spastic colon or mucous colitis or Irritable Bowel Syndrome (IBS). Symptoms include nausea often brief, repetitive waves, indigestion, gas, bloating, pain, cramps, constipation alternating with diarrhea and sometimes mucous stools. Trauma, infection or stress can aggravate or tip susceptible individuals into fibromyalgia but are not the basic causes. It is generally accepted now as an inherited disease and preliminary results from the research team at City of Hope support this belief. They have treated family members that spanned three generations including four two-year-olds as well as patients who became symptomatic only in their seventies. This age spread strongly suggests a multi-genetic disease in various combinations. Boys and girls suffer equally before puberty but females predominate (85% to 15%) thereafter. Forty percent of our patients recall "growing pains" in childhood that disappeared during the true growth spurt of puberty. Untreated fibromyalgia ultimately leads to a "tartar of joints" that we recognize as osteoarthritis. The FDA has approved three drugs to treat some symptoms of Fibromyalgia: Lyrica, Cymbalta, and Savella. Each of these was initially used for other conditions but was shown to be better than placebo (no medications at all) in reducing pain. Each has a number of side effects and many patients cannot tolerate them. A group called Cure Together polled 1,144 patients with Fibromyalgia to rate these drugs, among other treatments. They were surprised to find that patients rated Lyrica, Cymbalta, and Savella as making their Fibromyalgia worse, not better, rating rest and heat as more effective. Fibromyalgia is a chronic disease and will require life-style changes. The good news is that you can still lead a full life and control most of your symptoms at least most of the time. You can turn your health around. It will require taking charge of your health and getting into the best possible shape that you can and taking care of yourself each and every day. Fibromyalgia symptoms can intensify depending on the time of day -- morning, late afternoon and evening tend to be the worst times. Symptoms may also get worse with many factors. This includes fatigue, tension, inactivity, changes in the weather, cold or drafty conditions, overexertion, hormonal fluctuations such as before your period, or in menopause, STRESS or other emotional factors like grief or trauma. Many people report that their fibromyalgia symptoms started after a car accident. Difficulty thinking clearly - "fibro fog"
Sudden onset of severe pains after exposure to dry cold winds. Worse every movement, in warm room at night; thirsty, restless, touchy, scared. For burning, stinging, stitching pains, whole back feels tired and bruised. Worse heat and least movement; restless, irritable, depressed, wants to be uncovered and cool. Pain in the body that feels bruised and sore. Pain worse after exertion. Bed feels too hard. Soreness and bruised feeling is worse if the part is lain upon. 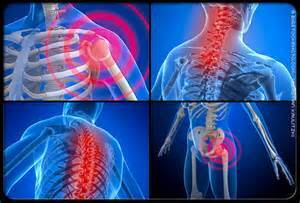 Spine very sensitive; spasms in muscles of neck and back; feels bruised, as if 'bed too hard'; WORSE from movement but has to keep moving; morose, irritable. Arnica is a good general remedy to start treatment of fibromyalgia with homeopathy for generalized pain. violent cutting or tearing pains, in neck, spine or hips. walks restlessly to and fro in search of ease. Worse when at rest; blazing hot, bellicose, bed seems to be 'surging up and down'. Paralytic pain, shoulders, arms, hands, legs, feet, beneath nails; thighs feel cold; heels sore. Worse walking; weakness and tiredness. Pain worse for the slightest movement. Heat makes the pain worse Pain is better from pressure on the painful part. Pains in nape, back, limbs; after exposure to dry cold, especially east winds; better from heat; worse from least movement; anxious, ill-at-ease, peevish, great thirst for large amounts at long intervals. Stiffness and pain in cervical region. Weakness of memory. Difficult comprehension and concentration. Worse cold, wet weather, drafts, especially melting snow. Worse change of weather. Worse from mental exertion, stress. Carpal tunnel syndrome. Numbness, tingling. Weariness and fatigue; never well since Mononucleosis; insomnia. Lies in bed knee to elbow, or arms above head. Better being occupied, open air; worse physical exertion, approach of a storm. Sensitive, passionate, fastidious, rebellious, sympathetic, strong sense of duty, authority problems. Soreness, weakness and stiffness. Worse with exertion and cold. Better for warm applications and being warm in bed. The muscles of the legs can feel contracted and sore. The person may have restless legs at night. Worse in dry weather. Drawing and tearing pains in limbs, especially at back of knee, with stiffness or weakness; lower limbs very restless at night. Worse from extreme heat or overuse. Sensation of tearing or burning pain, better with heat. Pain is better when it rains. Better in warm moist weather. Worse cold winds, draughts and taking coffee. For pain, soreness and stiffness are mostly in the neck and upper back muscles. Pain could have followed after an injury such as a car accident. Pain is worse for cold or drafts. Symptoms are often accompanied by headaches on the top of the head or radiating up from the neck. Pains drive from bed at night to walk the floor. Arms 'go to sleep' when grasping objects. Temper in a turmoil, nothing is right. Pains are intolerable. Pains are tearing, shooting pains in arms and legs. Symptoms rought on and made worse by cold, damp conditions. Fibromyalgia pains would alternate with indigestion and at times with skin rashes. Better in warm and dry weather. Better when she was active and moving. Pain with heaviness and weakness, often with tired limbs. Anticipation anxiety. Blurred vision. Person feels dull and droopy. Frequent urination. Excessive heat aggravates the pain. Worse lying down. Better with massage. For unbearable prickly pain that radiates along nerve pathways, also called neuropathy. Pain is worse with movement. Pain is worse when touched. Very helpful for painful extremities. Severe shooting pains in muscles, accompanied by numbness or cold sensation. Wandering pains, felt especially in fingers and wrists; pain at bottom of spine when sitting. Worse cold air, when snow is melting, 2 a.m. to 5 a.m.; cross and listless. Stitching cutting pains, often stabbing while at rest; pains extending up and down back and into thighs; WORSE walking; on attempting to walk feels as if 'back would break'; firm pressure in small of back gives RELIEF; irritable, touchy, can't stand noise. Pain on left, moves from left to right. Loquacity (talkativeness), passionate and can be jealous. Prone to sore throats or glandular infections. Aggravated by hot weather. Breast pain with armpit glands enlarged. Joints painful and weak; rheumatic affections. Nausea. Salivation. Discouraged, lazy, sarcastic, memory loss. Aversion to exercise. Pains move around. Pains worse from motion, cold, night. Pains which shift rapidly and spread centrally; associated with great stiffness. Better from cold. Worse from heat, movement, after sitting still for a while, least pressure. Pains which come on after a wetting, or overexertion, especially in lower part of back; hurts to turn in bed; muscles seem paralyzed; cramps in calves or soles at night; WORSE dry cold, before rain, first thing in a.m.; RELIEF when rain actually falling, firm pressure, towards end of day. Cramps in upper arms and wrists; heavy forearms. Stumbles easily. Weakness and debility. Pains in limbs at night as if bones were scraped. Better warmth, after short sleep; worse grief, loss of vital fluids, talking. Apathetic, despair, homesick. Mental dullness; effects of grief and mental shock. Nerve problems start from the fingers or toes and mover along limbs. Arms and hands numb. Hands weak. Joints give way suddenly. Sharp pains in elbows and shoulders. Weakness and trembling. Heat between shoulder blades. Oversensitive, impressionable, clairvoyant, sensitive to dark and thunderstorms. Wants sympathy. Emotionally open and sensitive person, very sympathetic to others. Fear of dark. Worse twilight. Craves fruit salt and chocolate. Nose bleeds. Has numbness of the arms and hands. The person struggles to hold things with hands. Better massage, rubbing, cold, open air; worse touch, physical or mental exertion. Sudden inflammation that spreads to the back. Soreness and exhaustion. Painful sensation felt in the bones that is worse with motion or movement. Symptoms are better with rest. Shooting pains in nape and elsewhere; neck and shoulders 'crack' on movement. Legs feel heavy in daytime and ache at night. Worse heat, stuffy room, first movement, evening and first part of night. Better from gentle movement and from pressure. Helpful with muscle pain and muscle stiffness, especially when the neck and back muscles are involved. Stabbing pains and soreness may be felt near the spine. Crawling and tingling in fingers; muscular pain along lower margin of the shoulder blade; sharp pains in right forearm while writing. Skin problems; shingles with bluish eruptions. Burning, itching pains. Palms itching. Better standing, sitting bent forward; worse open air, damp, cold rainy and stormy weather. Irritability with pains, anxious, fears ghosts so can’t be alone; desires to die; quarrelsome. Pains are much worse for changes in the weather, especially if there is an impending storm or thunderstorm. This remedy is very similar to Rhus tox. This remedy was studied and was shown to be very effective in a double blind placebo-controlled trial of fibromyalgia. One of the most useful remedies in this condition; pains brought on by over-exertion or exposure to cold and wet; back pain is relieved by bending body backwards; finger tips feel numb on grasping objects; pains and stiffness worse after rest. Better by continued movement; extreme restlessness of mind and body. Used pain and stiffness which is worse after being still or sitting. Better for moving, gentle motion. Worse after too much physical exertions. Worse in cold, damp weather. Pain is better by warmth and moderate exercise, gentle pressure or massage and stretching. Deep pain sensation in tendons, joints and bones. Bruised feeling. Marked stiffness that is not better with gentle movement. Tendons are painful or places where tendons meet bone such as heels and elbows. Feelings of fear, anxiety or paranoia. Pains are worse for cold, damp weather. The pain is not improved as much from warmth. Also very similar to Rhus tox except that it effects the tendons and ligaments instead of the muscle tissues. Rhus Toxicodendron is one of the most prescribed for tearing pains in tendons, ligaments and fascia, especially at the nape of the neck, in the loins and extremities. Ruta graveolens is used for severe body aches in the entire body, as if being bruised, due to muscular weakness. Zincum Metallicum is for lameness, weakness, trembling and twitching of muscles. Gelsemium is very effective for muscular pains with excessive trembling and fatigue of all limbs. A key symptom for prescription of Gelsemium is fatigue in limbs with the slightest exertion. China (Cinchona Officinalis is the most well indicated among Homeopathic medicines for fibromyalgia with fatigue and general debility. The person complains of pain in the limbs and joints with weariness and fatigue even at the slightest touch. Bryonia Alba for pain in the limbs and joints, along with marked stiffness so that every spot feels in pain at the slightest pressure. Rhus Toxicodendron is very beneficial in stiffness of joints which gets better with warmth, motion and massage. The person experiences numbness and prickling of limbs after overwork and exposure to damp or cold weather. Colocynthis is the most effective among Homeopathic medicines for fibromyalgia with agonizing, cutting pain in the abdomen, causing the person to bend over for relief. Nux Vomica is one of the most prominent homeopathic medicines for fibromyalgia alternating between constipation and diarrhea. The person complains of heaviness and bloating in the stomach soon after eating. Kali Phosphoricum is for treating difficulty in concentration. The person usually experiences extreme lassitude and depression in such cases; the slightest labor may seem like a huge task to him. Anacardium is for absent mindedness, impaired memory and diminution of the senses (smell, sight and hearing). Magnesia Carbonica is for unrefreshing sleep. The person feels more tired on rising than on sleeping. Lachesis is for sleep disturbances. The key symptom for prescription of Lachesis is that the person feels sleepy, but cannot sleep. Belladonna is amongst the most prescribed with headaches, especially with much throbbing and heat. Sanguinaria is for periodical headaches, with pain in the back of the head. Phosphorus is the best prescription for fibromyalgia with numbness of the arms and hands. The person struggles to hold things with his hands. Hypericum is for fibromyalgia with tingling, burning pain and numbness in the whole body. Crawling sensation in the hands and the feet with severe pain in the upper and lower limbs. Rather than taking synthetic dietary supplements, one natural source is apple cider vinegar. The recommendation is to make a tart beverage containing eight (8) ounces distilled water, one tablespoon raw, organic apple cider vinegar and two teaspoons raw honey. This beverage should be consumed three times a day for a multitude of health benefits. Adding Epsom salt into this beverage to bowel tolerance has the same effect as a malic acid and magnesium dietary supplement. Many naturopathic physicians recommend making fresh apple juice with Granny Smith apples to get the daily dose of malic acid. Freshly juiced, raw, unsweetened cranberries are also high in malic acid and provide a tart beverage. The two juices may be blended together for another option. These are which are inhibitory neurotransmitters have been helpful in lowering stress levels by controlling limbic firing in the brain. Malic Acid: Clinical tests are proving malic acid to be a great asset in the treatment of fibromyalgia and chronic pain. In one clinical study, reported in "The Journal of Nutritional Medicine," 15 patients (aged 32-60) taking a dosage of 200-2400 mg. of maIic acid with 300-600 mg of magnesium for four to eight weeks, reported significant pain relief within 48 hours. These positive effects continued to increase over the test period. If the fibromyalgia person chooses to take a malic acid and magnesium supplement, it is suggested that it is best to start with 600 mg malic acid combined with 150 mg magnesium twice a day. Over time, this can be increased to as much as 1200 mg malic acid and 300 mg magnesium. There are confirmed studies that have found that taking at least 2400mg of malic acid a day will help with fatigue and the pain associated with fibromyalgia. But you have to start out slow. These have also been shown to be deficient in both Chronic Fatigue Syndrome and fibromyalgia sufferers.